The morning was sunny and humid and the trees were filled with wild, noisy macaws sporting black feathers, crimson tails and white beaks. Our first excursion was to the lagoon. The swedes spoke highly of it the night before and we were not disappointed. I made friends with a man from Missoula with a Martin, who let me play it before we jumped into the man-made lagoon. As someone who used to swim quite frequently and often reeked of chemicals for hours after, this pool was a fascination. No chlorine. I have no idea how they did it, but the water tasted only a little salty and was the temperature of bath water. We paddled around and then, on the instructions of a local, found the best lunch spot a few blocks off the main tourist track. Cafe One 3 was nestled in a gym and dished out some seriously bomb salad. The flavors of this thing and the variety of vegetables. I would go back to the Whitsundays just for another of those salads. Highly recommend. At 3:30, we met Keith, along with the rest of the crew, and headed out to his trimaran moored outside the marina. I have never sailed on a boat of this size, so was a little nervous. After getting Wild Thing all rigged up, it was time for a fantastic race around the bay. The sun was shining on the vibrant blue-green water and it reflected off the crisp white hull. I was happily was relegated to “rail meat” after a few gaffs in the pit and thoroughly enjoyed the race from my perch. 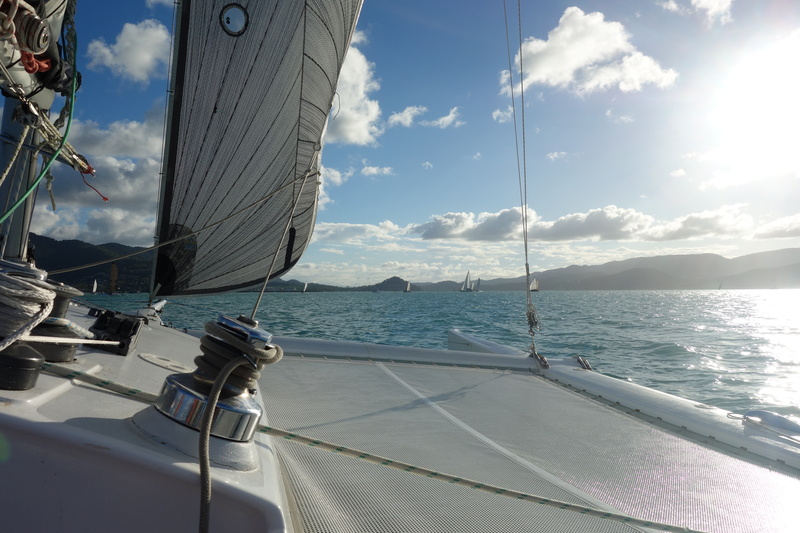 I’ve often been jealous of how much speed the catamarans and trimarans enjoyed in past races and was thrilled to experience a twenty-or-so knot finish. I love sailing. After the race, we met up with the rest of the crew for dinner at the sailing club. No surprise, Wild Thing came in first in her class and first overall. After more delightful conversation with Keith’s wife Gail and daughter Cass, it was time to turn in for some rest before our tour the next morning.